158 " 144 " 150 " 158 " 160 " 165 " 167 " 170 " 171 " 173 " 176 " 178 " 184 " 196 " 198 " 204 " 205 "
Make a Selection .035 x 1 1/4 " .042 x 1 1/4 " .045 x 1 1/2 " .055 x 1 1/2 "
Make a Selection 7/8 "
Continue selecting options to choose a blade that fits your needs. * Free shipping only valid for contiguous US and only available for standard ground shipping. Wood-Mizer's Vortex™ dust removal blade will clear the dust from your cut like no other blade on the market. This extremely unique profile has generated extraordinary results in high production pallet factory tests. Patent pending and trademarked for its revolutionary design and results, this blade's ability to leave only a trace amount of sawdust will leave you spinning and forever change your expectations of what is an acceptable amount of sawdust from a dust removal blade. Wood-Mizer LT15,LT15START, LT15GO, LT28, LT35, LT40, LT50, HR120, HR130, HR300, HR500, HR700 158"
Wood-Mizer LT40 Wide, LT50 Wide, 171"
Timberking 200, 2400, 2500 177"
Norwood Lumbermate 2000/LM29/MarkI-IV, LumberMan MN26, LumberLite ML26, LL24 144"
Norwood Lumbermate Pro MX, LumberPro HD36 167"
Hud-Son Oscar 230, 30 160"
Hud-Son Oscar 36/236/330 Pro, Farmboss 36, H-360, HFE-30, HFE-36 167"
Understanding sawmill blade geometry and terminology can be complex. Here is a crash course in choosing a blade profile that is best suited for your sawing application. Eliminate downtime and keep sawing with these 10 helpful tips to increase your bandsaw blade life expectancy. 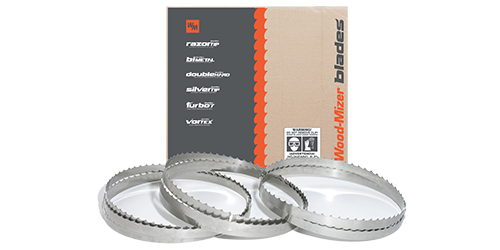 Use Wood-Mizer's resharp® blade sharpening service or your own blade maintenance equipment to ensure your bandsaw blades maintain maximum precision and performance. When installing a new sawmill blade, make a few cuts at a moderate speed to "break in" the blade. Also, minimize skim cuts when only one side of the set tooth is sawing. 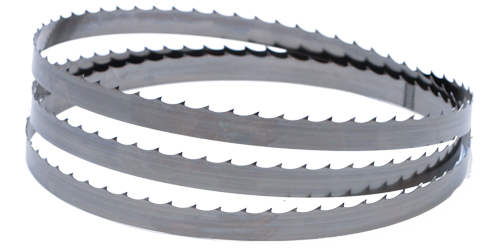 Keep drive belts tight to transmit higher horsepower to the sawmill blade, especially with new belts that need tightened more frequently. Trees vary in density, which requires different cutting techniques and feed rates. Wood density change as logs dry which makes sawing more difficult. Lubricating the sawmill blade can lead to higher sawing performance, reduced pitch build up, longer life between blade sharpenings, and overall blade life. Dirt, rocks, sand, and other foreign material that may be in the log will wear the teeth considerably faster. A debarker can help with this. Periodically check hydraulic tensioners, air bags, and springs, because proper tension is critical for maximum blade performance and cutting speeds. The blade wheel belts must be in good condition to reach peak performance because worn belts can lead to blade tracking problems. Swapping drive side and idle side can extend belt life. Feed rates should be as fast as possible while still maintaining a straight cut because cutting at slower speeds reduces overall bandsaw blade life. If the blade guides are tipped upward or downward, they will cause the blade to cut in the same direction. Keep rollers tight and make sure the blade is not continuously contacting the back guide or roller flange. Wood-Mizer offers a variety Of customized sizes And lengths To meet any sawing need. Contact us If you require specialized blades.